Disclosure: Any books donated for review purposes are in turn donated to a library. No other compensation has been received for the reviews posted on Home School Book Review. Gaskins, Teresa. 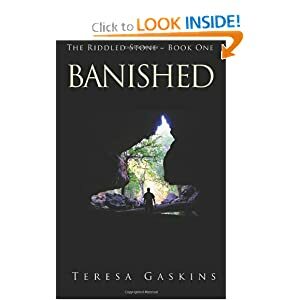 Banished: The Riddled Stone, Book One (published in 2012 by Tabletop Academy Press, Blue Mound, IL). Christopher Fredrico is the nineteen-year-old son of a nobleman, Earl Diard Fredrico, in the kingdom of North Raec, ruled over by King Miles. Chris’s oldest brother Anthony is a knight in service with the Duke of Grith, and his twin sister Trillory seems to have some magical abilities. Formerly a united realm, the kingdom of Raec was divided into North Raec and South Raec following the Great Reac War. During the war King Miles had followed a series of cryptic clues that led him to the magical Riddled Stone, surrounded by hard, black rock which split into five Shards. This enabled him to make peace. For the past four years, Chris, who is planning to become a scholar, has been in school with his three friends: Arnold, who is training to become a knight; Nora, from the city of North Yorc; and Terrin, of the forest people of Xell. At a party for Crown Prince Tyler Coric, a man named Darwin, who is the caretaker for one of the Shards, announces that it has been stolen and shows a brooch marked with the seal of Earl Diard’s house which was found at the scene. Chris’s brother Anthony then comes forward to accuse Chris of the crime. Because of the evidence and Chris’s inability to prove his innocence, he is banished by Prince Tyler from North Raec and given one month to get out of the country or forfeit his life. Arnold, Nora, and Terrin decide to go with him, but on the way to the Diamond Isles, Chris changes his mind and determines to start looking for evidence that might prove him innocent. But before they get very far, they are attacked and captured by a group of savage Harpies. Will they survive the attack and be able to escape? Will Chris ever find anything that will help to show his innocence? And what is his brother Anthony’s motive for accusing him? Banished is a captivating fantasy story with a well-thought-out plot that would be a credit to any writer. But it is especially remarkable coming from a thirteen-year-old student who has been homeschooled all her life. Teresa Gaskins actually wrote this book as a project for the National Novel Writing Month program. One noteworthy thing about the book is that there is no sexuality or bad language (the euphemistic interjection “Blasted” is used once), so, other than those who object to the presence of any kind of magic in books, parents can let their kids read the novel with no reservations. However, be forewarned. When you reach the final page and find the words, “Not the End…,” you will cry, “Oh! No!” The story does not resolve itself at the end and then pick up in a sequel. Rather, the plot is left hanging at the end and will continue in another book. I for one feel as if I simply can’t wait to read the next installment to find out what happens to Chris and his friends. It’s that good!